What it’s like to struggle with the decision to keep coloring your gray hair. Why you can feel chained to this expensive and time-consuming routine. What it’s like to let your gray hair grow out naturally. Why it’s important to take this journey together with your hair dresser. Why it’s so common to feel self-conscious about going gray. The surprising way that strangers want to connect and talk about it. Why women think it’s brave to go gray. What it can be emotional to go gray after all these years. What’s surprising and amazing about going gray. How getting reacquainted with your natural hair color can be an interesting way to bust out of your midlife funk! This week’s episode features an interview with someone who thought about letting her hair go gray naturally for years and finally did it. The interview’s part of the mini-series, Getting Real with Women in the Middle, where you’re introduced to an amazing woman in the middle who made a big scary decision so that she would be happier in midlife. 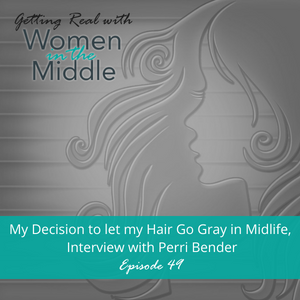 Perri Bender is a 53 year old woman in the middle who was extremely aggravated with the whole “dying your hair” thing. Her gray roots were the bane of her existence. Perri thought about letting her hair go gray for a very long time. It’s always been in the back of her mind. 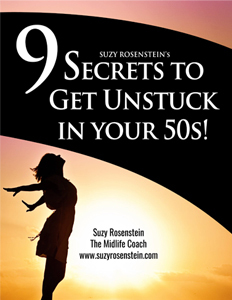 She absolutely hated the chemicals, the time and the money associated with coloring her gray hair. She tried ditching the gray about 15 years ago. Questions like, “What’s going on up there?” hid a subtle, or not so subtle judgement that it’s better to cover up the gray. She didn’t continue at that time. Finally, however, one year ago, Perri decided to experiment with going gray again. One thing she noticed was how common it was for women to think she was brave to go gray. She also found that women wanted to talk about it out of curiosity and support. Perri discusses the concept of freedom related to this experience; she also shares what it was like emotionally to make this change in her life. Perri’s advice? If not now, when? The hair thing is easy. Talk to your stylist and remember you can always change your mind! Perri’s so much more comfortable with it now and excited about how she’ll look in a few more months!